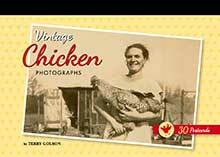 Contains 30 Vintage photographs made into mailable or frameable post cards. The pleasures of poultry keeping are nothing new, as these vintage photographs attest. Here you'll find chickens in arms, on heads, in laps, underfoot, and even on a bicycle!